It has only been a day since I downloaded Object Desktop and started messing around on Skin Studio, but I can't find any skin or any way that I could do that myself to make the System Buttons (Minimize, Maximize, Restore, Close) not only look but feel like the original ones in the default Windows 10 Theme. I made the icons and positioned them correctly but I can't find a way to change how big their clickable area is and the close button although it looks like it's on the very top right, if you put your cursor on the very top right on a fullscreen window you can't click it and you actually have to move your cursor a pixel to the left for the close button to be clickable. The clickable area is determined by the image size. If you want a larger clickable area without making the button larger (as in, "What you see"), make the image bigger by adding an area of transparency around each of the frames in your button image (which will make the overall image larger). 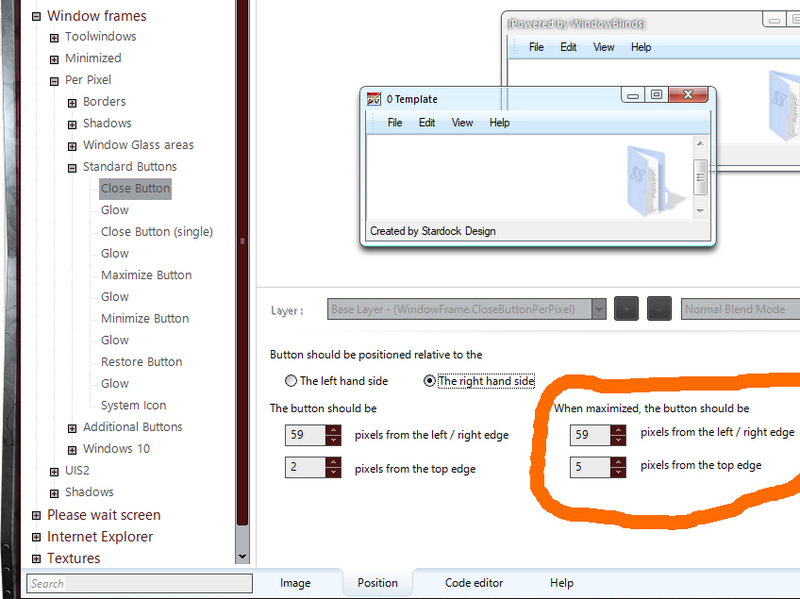 You'll need to adjust the positioning accordingly, and you don't want the transparent areas to overlap each other between the buttons on the window - it'll make the mouseover and clicking areas inconsistent. 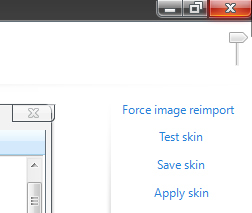 In Windows 10 default style you can see the Close button on the very top right, whereas in every skin I've seen so far and the given templates on Skin Studio are having a Vista kind of style whereas the Close button is a bit to the left instead of the very right of any window. Is there a way I can make it similar to the Windows 10 default style with it being at the very top right position? I have a problem still as seen here. I can't change the text from that. 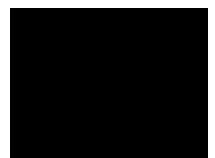 Also similarly can't seem to find how to change the black text from here and there's also that white vertical line that can't be changed too. Lastly I can't seem to find where you can change the background from the tray Oh and let's not forget this bug that keeps showing this extra little line on the right of the icon inside the vertical scroll no matter what I change on the imported image, and that pesky half colored window thing here. None of those areas in the above comment can be changed voymike because they are either forced by the operating system or an application itself. Welcome to the aggravating world of skinning. 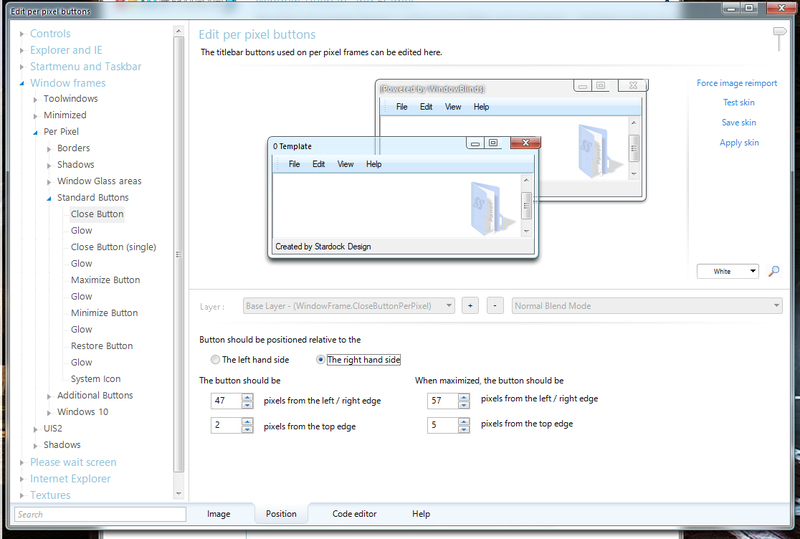 Image defined in Explorer and IE / Additional explorer sections / Left hand line (and) Right hand line. 3 pixels wide. If an image is defined it will be used instead of the System Color. The line thing was fixed, thanks a lot! As for the tray though, I was able to change it but there is no mouseover color. Oh and did I mention that I find literally nothing that touches the inside area of the windows media player? I can't change the taskbar icons position. Just left click and hold button on any icon you want to move. Move it over other icons left or right and release when it's where you want it. If you increase the top and bottom text margins on the taskbar buttons your taskbar does not get taller? Mine does here, at least in Windows 7. @LightStar, I was using 5 on bottom but I now splitted it to 3 top and 2 bottom and it's exactly where I want it. Thanks a lot! Okay now I'm having problems on the preview popup window when you hover an opened program from taskbar. I can't move the X button using margins and even though I'm setting it to have transparency, the preview background + preview items bug around the edges. Need to add an area of transparency in the image. Need to add 2 pixels on the right side for every pixel you want to shift it to the left. I think the top is 1-for-1. the preview background + preview items bug around the edges. I think you have a little shadow/shading in the transparent area of your image, right? When you mouseover the preview itself the blurring disappears? If that's what it is the only way to get of the blurring before mouseover is to delete the shading from the transparent areas. That's correct, there is none. One of those applications that has it's own look coded in. I don't really understand the the X button thing yet. Moving it the images on photoshop does nothing in regards of the position of the actual button itself, and shifting the margins does literally nothing. No I don't have anyway shadow effect around, it's just a solid color similarly to how it's on Windows 10 but the blur still happens no matter what I try to alter. Do you have both a Preview background and a Preview item image defined? You're going to have to post screenshots of both those images, the actual images in Photoshop. I'm having a little trouble seeing what's going on there and it seems like I see some gradient at least at the bottom of the background. Those 2 are my background + item menus on startmenu preview. This is what I'm trying to get to fit into above images, although the current examples (sizing, spaces in between frames etc) might be off themselves, I just want to state that I have tried multiple combinations of moving the frames or toying with the pixels and the margins too. Remember if you are using vertical buttons you have checked "This image has frames stacked vertically. Un-check if using horz buttons. voymike: The buttons DaveRI is showing are for the popup menus. At least I think so. I take it you have the frame buttons thing fixed. Ok I thinkg DaveRI fixed it. Thanks a lot! So I'm thinking you're still having a problem with the background image and item image. If they came down right for me, you have a fair amount of transparency around each of them. You need to have the painting margins set high enough to get into the solid part, looks like 25 pixels all around on both images would work. It's almost perfect expect for the dark line underneath when hovered. Any ideas on what's causing that? Since I'm going to bed, I will just leave this here so I can continue tomorrow. Problems are the 2 white lines (under the search box and the under the working on it text) and the whole maximized frame. The icon looks misplaced, and although I perfected my normal window frames I can't really find a work around with transparency on this one. If you're talking about the 14 pixel high darker area, that's just the Preview Background showing behind the Preview Image. The Preview Image doesn't go all the way down to the taskbar. If you want to get rid of it you'll need to add a transparent area to the bottom of the background. It will be transparent all the time though, even when you're not mousing over the preview image, and that's probably not what you're wanting. I added a tiny section of gradient on the bottom and now it flashes perfectly in. On my newest problem though, my top frame on a maximized window is not showing correctly, the system buttons (_,☐,X) are a bit cut off on their bottoms and the system icon on the top left is misplaced. Oh and by the way, I still haven't figured out how to change those 2 white elements right there. system icon on the top left is misplaced. You can move the system icon around the same way as the close button icon in Reply #1. The setting is in the same area under "System Icon". [edit- And see my next reply on the next page too] I think your options are to make the visible areas on the buttons smaller and/or change the button placement. There is a separate image setting for the Maximized Caption under the Per Pixel / Borders setting. You might try making a taller image for it, but I don't really know how much control you have over the height of the Maxed window caption. Somebody else might. Now you're getting outside of my playground. I don't know anything about the large horizontal white line. The File Explorer Search Background is an image defined by Edit Explorer / IE shell parts / Edit Explorer parts / Explorer Windows / Glassy Areas / Search field background / [Image]tab. That is also used in the Start Menu Search background. If no image is defined it uses System Color / Window Background.